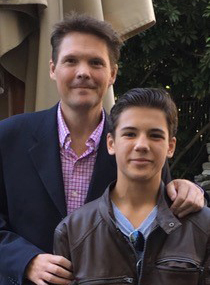 The Whitney Family Foundation was started by film producer Steve Whitney after his successful double transplant surgery at Stanford University in October 2015. Grants from the Whitney Family Foundation will support nonprofit organizations that provide organ donor registration services and conduct medical research to advance the knowledge and application of organ transplantation procedures. Some selected film projects Whitney has worked on are “Girl, Interrupted” which garnered Angelina Jolie the Academy Award, “Amityville Horror” with Ryan Reynolds which opened #1 at the box office, “The Hurricane” with Denzel Washington, the PBS documentary “A Wing & A Prayer” about IAI founder Al Schwimmer, and recently, executive produced with Simon Cowell, the Golden Globe nominated film “One Chance” about opera singer Paul Potts. 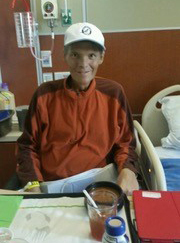 Steve Whitney before his 2015 surgery at Stanford hospital. Whitney’s kidney and liver failure came as a surprise at the age of 44. He had been athletic all his life and lettered in football, basketball and baseball in high school, and remained active through college at Santa Clara University. In his late 30s, after running back to back L.A. Marathons, Whitney’s health and energy started a continuous decline. At a function, Whitney was so weak and ashen that family members insisted he rush to the hospital. He was immediately admitted to Stanford University under the care of Dr. Aijaz Ahmed with kidney, liver and pancreatic failure. For the next six months, Whitney was in and out of the ICU with constant dialysis. In September of 2015, with his Model for End-Stage Liver Disease (MELD) score at a fatal 53, he was given last rights and recommended for hospice care. Steve Whitney after surgery with his son Robert. Thanks to the incredible doctors at Stanford and a miracle, Whitney was blessed with being an incredibly fortunate recipient of both a kidney and liver transplant. Whitney has dedicated himself to giving back to the organ transplant community. His focus is to help raise funds and awareness as well as share the message that not only can organ transplants save lives, but give a quality of life that can be better than it was before surgery. In June of 2017, Whitney held a music festival on the banks of the Mississippi River to raise money and register new organ donors. He is grateful for the gift of life and enjoys the precious moments he has been blessed with, with his family and son Robert. This fund is dedicated to, and supports the need for Organ Donor registration and medical research. Every 10 minutes, someone is added to the national transplant list. On average, 20 people die EACH DAY waiting for a transplant. The Whitney Family Foundation will use its entertainment relationships to promote grass roots outreach, and grants from the Whitney Family Foundation will support nonprofit organizations that conduct grassroots work to register new, potential organ donors. Nearly 22,000 people in California are currently waiting for an organ transplant. This fund’s goal is to register enough new donors to help eliminate the wait list. This is a tangible solution that can be attained for those in need of transplants.